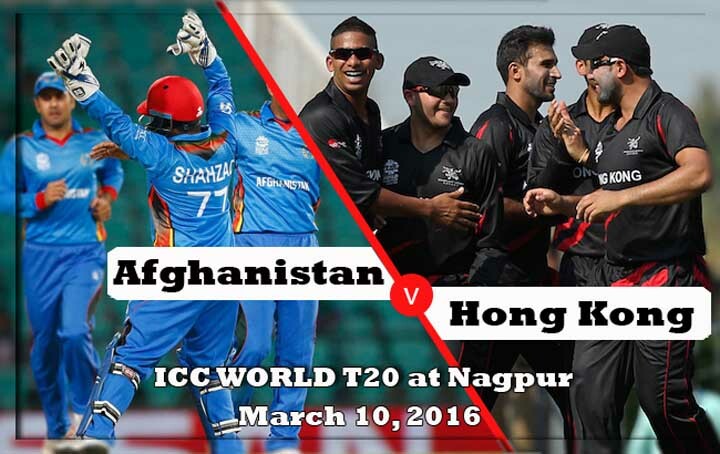 Afghanistan vs Hong Kong, the Sixth Qualifier match of ICC World T20 2016 will start at 19:30 IST (14:00 GMT) at Vidharba Cricket Association Stadium, Nagpur, India on March 10, 2015. From the four face to face matches against this two teams, Afghanistan won two matches and Hong Kong won two of the matches, that to recent games. Update: Hong Kong win the toss and chose to bat. In Match 2, Afghanistan beats Scotland by 14 runs with the peak score 170 runs. Asghar Stanikzai scored 61 runs from 31 balls and Mohammad Shahzad marked 55 runs. Rashid Khan picks 2 wickets. Hong Kong lost their opening game against with the team, Zimbabwe. Also, the team continuously failed to pick the winning status. Tanwir Afzal, captain of the team faced the map as a key player by picking two crucial wickets and scored 31 runs in 17 balls in the last match with Zimbabwe. So, if this man may lined-up in top order mean, there is a good scope for Hong Kong to win.